1,827 total shares. Be the next! 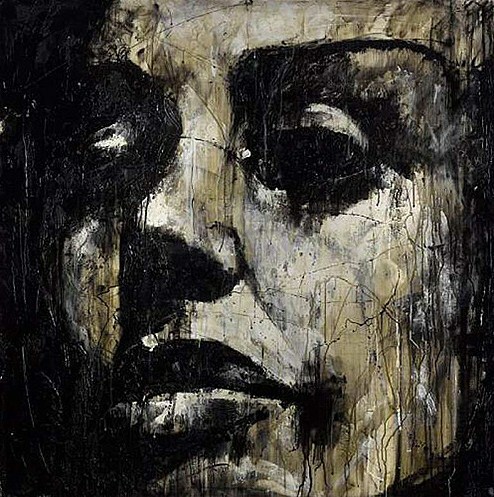 Guy Denning uses not only powerful brush strokes to express his emotions deeply but also scratches the paint to show the audience the intensity of the emotions he is trying to portray with his artwork. Denning’s work involves other techniques such as blacking out eyes and mouths maybe to emphasize Denning’s theme of darkness, horror and maybe even despair. He also sometimes uses the thickness of his lines to balance the painting. A question that is often asked about Denning’s work is therefore whether it reflects his own emotions and feelings, for example does Denning really feel the emotions of Melancholy, solemness and anger or is the artwork simply presented the way it is for the shear sake of it. This is what art is all about! It isn't suppose to be confined or contrained! These are two very powerful images of women displaying empotional intensity. Incredible, to say the least! I would like to know about purchasing painting from this artist, this painting has so much emotion. Many portrayed in on piece. Mr. Denning you have captured my heart. Creepy but interesting. It's not like some of the gay modern photography art iv'e seen before. He's got talent. Fantastic work!! The video is great. i can't see a thing! it's all tenebrous. is it the portrait or me? probably, with some light closer, the features will clarify. all the negritude topics that i have seen were brushed smoothly. and despite, all there was light with the dark, with the tenebres. black was not a problem. but, this one, one ray of light doesn't have a chance to penetrate...pity, that's what the portrait is! perhaps one day, the light will come to me : and i'll see bright! I think it is a powerful painting. The background color and the body color are beautiful together and I think the touch of cobalt turquoise to separate and add punch are just right. She look to me like she could be all hot and sweaty from playing tennis. I also like the tension of part of her head out of the painting, it is very intimate.